Jaguar will launch its most potent series production car ever, the all-new XKR-S, next week at the Geneva Motor Show (3rd March to 13th March, 2011). This new model will significantly broaden the appeal of the XK range, offering enthusiastic drivers a compelling, fresh choice in the luxury GT class. With an uprated supercharged V8 engine, overhauled suspension and a new aerodynamically-driven design, the XKR-S is the ultimate expression of Jaguar's long held duality of purpose: GT luxury with incredible performance. "The XKR-S is a bold and exciting new model for Jaguar," said Adrian Hallmark, Jaguar's new Global Brand Director. "We expect to attract both loyal and new Jaguar driving enthusiasts who still want the comfort, opulence and class only a Jaguar can offer, combined with inspirational performance." The Jaguar XKR-S produces 405 kW and 680 Nm of torque, enough power to offer a top speed of 300 km/h (on a motor racing circuit). Its performance credentials speak for themselves with 0-100 km/h taking just 4.4 seconds. The XKR-S is not merely the quickest Jaguar ever, but also the most agile, responsive and driver-focused. It exploits the XK's strong, lightweight aluminium body architecture to maximise both handling and economy. 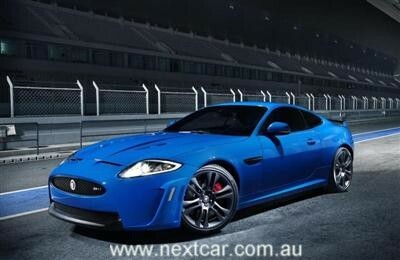 Alongside its incredible performance, the Jaguar XKR-S is the only car in its class that emits less than 300 g/km CO2. Bespoke suspension changes to the front and rear offer ultimate precision, control and driver appeal, while a reprogrammed Adaptive Dynamics system allows the enthusiastic driver to explore the edges of the handling envelope. Alongside the exciting new XKR-S, Jaguar will be marking the 50th anniversary of the E-Type with the first in a series of celebrations that take place during 2011. Jaguar will be hosting E-Type drives at the Parc des Eaux Vives in Geneva, where the original car was launched by the marque's founder Sir William Lyons half a century ago. The appeal of Jaguar E-Type transcended the automotive world. Such is the inherent rightness of its proportions, stance and purity of line, that it is a permanent exhibit in New York's Museum of Modern Art. Its influence is still apparent in Jaguar's modern range - products that offer a peerless blend of performance, comfort, cutting-edge technology and award-winning design. "It is impossible to overstate the impact the E-Type had," said Ian Callum, Jaguar Design Director. "Here was a car that encapsulated the spirit of the revolutionary era it came to symbolise. We're looking forward to celebrating achievement and looking forward with our all-new sports cars in Geneva."